The Philly Special, as recreated by thefourmonkeys. Since the Eagles won Super Bowl LII, there's been an endless stream of postgame content for Birds fans to consume. There’s the mic'd up specials from NFL Films, the appearances from the players on talk shows, The Player's Tribune features — the list goes on. There will be even more in the coming months. Most notably, the Eagles will get the "America's Game" treatment from NFL Network sometime in September. To hold you over until then, here's a rather clever recreation of the championship game against the New England Patriots. 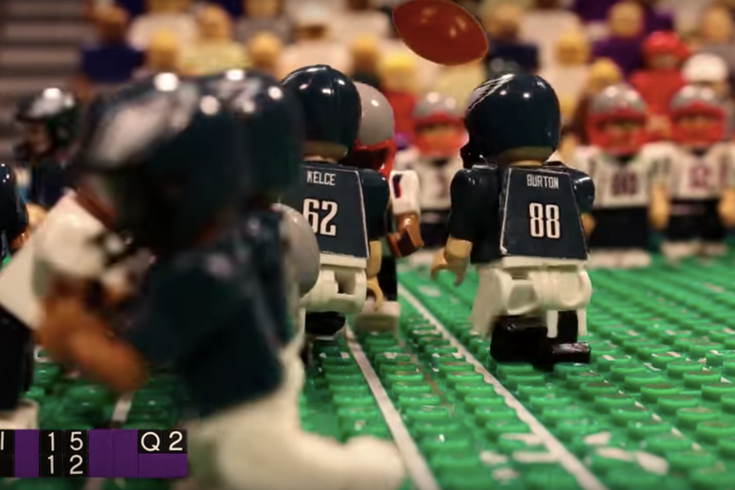 YouTube user thefourmonkeys recreated the highlights from the game using Legos and stop motion animation. The group of animators did this in 2016 with the Cubs' World Series win, gaining national media attention. According to thefourmonkeys website, the YouTube channel is run by a family of four who together wish to remain anonymous. They're not the only ones to recreate iconic sports moments with Legos. Remember watching Villanova's national championship again with a little brick version of Kris Jenkins?